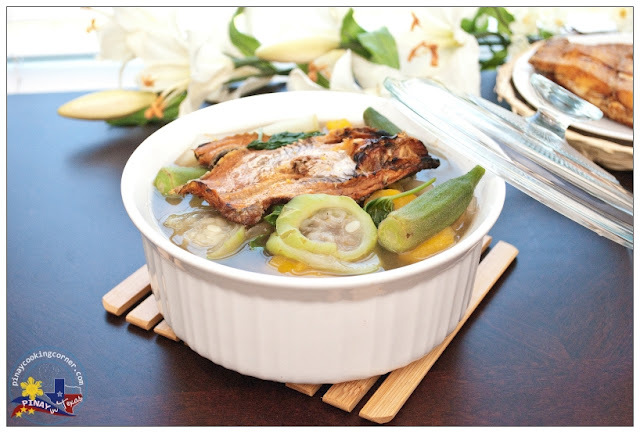 The manner in which Bulanglang is cooked varies from region to region. This one I'm sharing with you is my dad's version from Batangas. Though the vegetables I used for this recipe are what's available here in my side of the world and may be different from what's commonly used, the way of cooking is the same. I'm bringing this to you in connection to Kulinarya Cooking Club Challenge. In the Philippines, Nutrition Month which focuses on the importance of eating vegetables is celebrated in the month of July. That is why Isabel of My Expat Mommy and Kai of Bucaio chose the theme "Pang-Habang-Buhay", and we're supposed to share a nutritious dish that contains either vegetables or fruits. Bulanglang is just perfect for that! 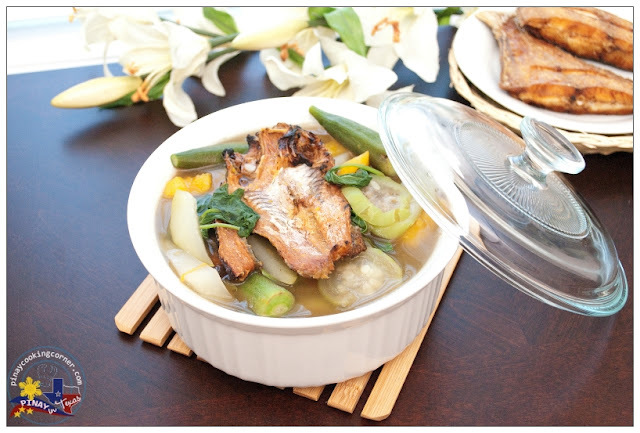 If you want to eat a "guilt free" meal, with no oil, no fats, no meat at all, Bulanglang is the answer! The best thing about this dish is that you can choose the vegetables according to your liking. Just be sure to know which vegetables should be added first. The hard vegetables like papaya and kalabasa should go first, and the soft and leafy vegetable should be added last. 1. 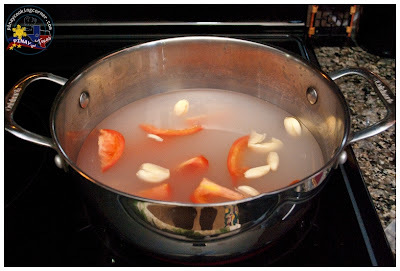 Put rice water, tomatoes and garlic in a big pot and bring to a boil. 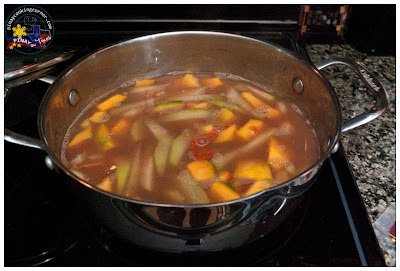 Simmer for about 5 minutes or until tomatoes are soft. 2. Add bagoong and papaya. Cover and simmer for about 5 minutes or until half cooked. 3. Add squash. Cover and simmer for about 5 minutes or until half cooked. 4. Add okra and patola. 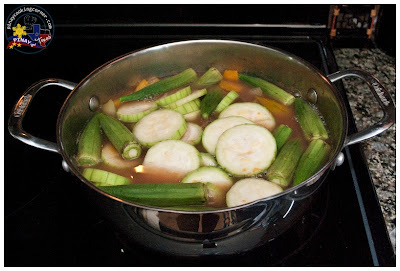 Cover and continue to simmer until okra is almost cooked. 5. Add kamote tops and biya and cook for 3 minutes more. Remove from heat. Serve with hot rice. 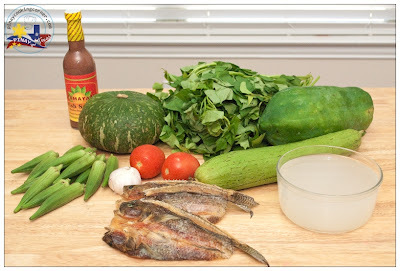 *Note: Other vegetables that can be used are upo (bottle gourd), sitaw (string beans), sigarilayas (winged beans), talong (eggplant), wild mushrooms, malunggay fruit, bulaklak ng kalabasa (squash blossoms), dahon ng sili (chili leaves), saluyot (jute leaves) and malunggay leaves. Some use ampalaya (bitter gourd), but in Batangas, ampalaya is only for Pinakbet and never used in Bulanglang. Oh yes, bulaklak ng kalabasa is so good Ray! I wonder when I will ever find that here! Hi Tina, your this dish look excellent. I love the dried fish, so tempting and appetizing. Tina your Bulanglang looks incredibly tasty! 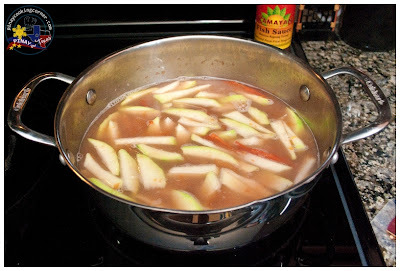 I love how healthy and delicious recipe sound, however pictures are telling that story too! Wonderful!!! Have a great weekend! Sarap! I love Bulanglang, more so now that I'm an adult. Thanks for sharing the step by step. Good to know a Batangas version. Happy weekend! That stew looks delicious with fish and vegetables. I need to learn your eggplant salad. 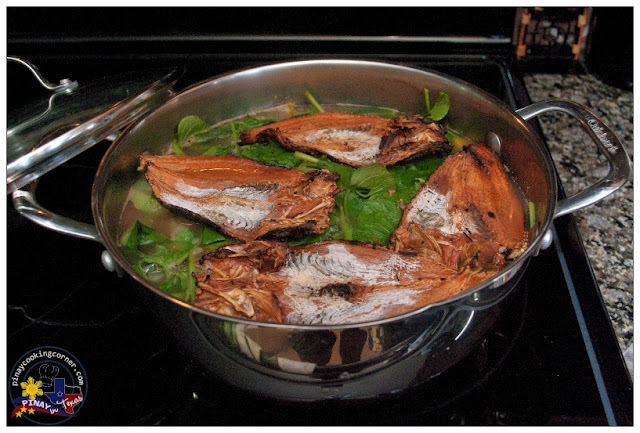 Healthy and interesting recipe,love dried fish.Happy Weekend! Oh,,,,this is very intersting dish,sound delicious with these ingredients combination,especially dried fish !! This is my father's favorite dish!! Oh I know this so well! My batanguena mom cooks this :-) Vegetables can be anything but I love it with kalabasa flower. And yes... the dried fish flavor. Comfort food indeed. Coming over from the Baking Partners. Glad to expand my bloggo-circle via this group. I can only imagine how delicious this dish was! my parents did the same for me! I was never scared of vegetables- well except for potatoes for some reason. that took me a while to like. this dish looks amazing, beautiful and ful of flavor! I love all of the veggies! Great post, Tina! We had the same experience growing up, and yes, boiled vegetables are the best!